Wireless Luggage Alarm for Travellers! Electronic Anti-lost Alarms are very easy to operate. 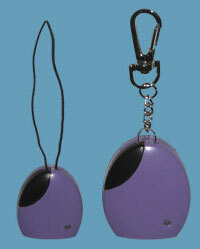 Attach the transmitter to the object to be protected and keep the key chain receiver with you. The receiver will sound an alert and vibrate if the transmitter moves outside your preset safety limit. Therefore if someone tries to steal your bag, you'll know before they are out of sight. During long airport layovers you might want to close your eyes and get some rest. However, this is practically impossible to do without risking your bags being stolen while you are sleeping. A Luggage Monitoring Alarm allows you to guard your belongings at all times, and reduces the chances of them being lost or stolen.